Here at The Foam Shop, we’ve taken customer education seriously since 1974 and want to help clear the air on the differences between high-quality and lower-quality natural latex foam to help you make informed decisions. With the ongoing increase in consumer and environmental awareness, more and more products are appearing in stores and online these days being marketed as “natural latex.” But is every natural foam fully natural? And how can you separate the higher quality natural foam products from the lower? 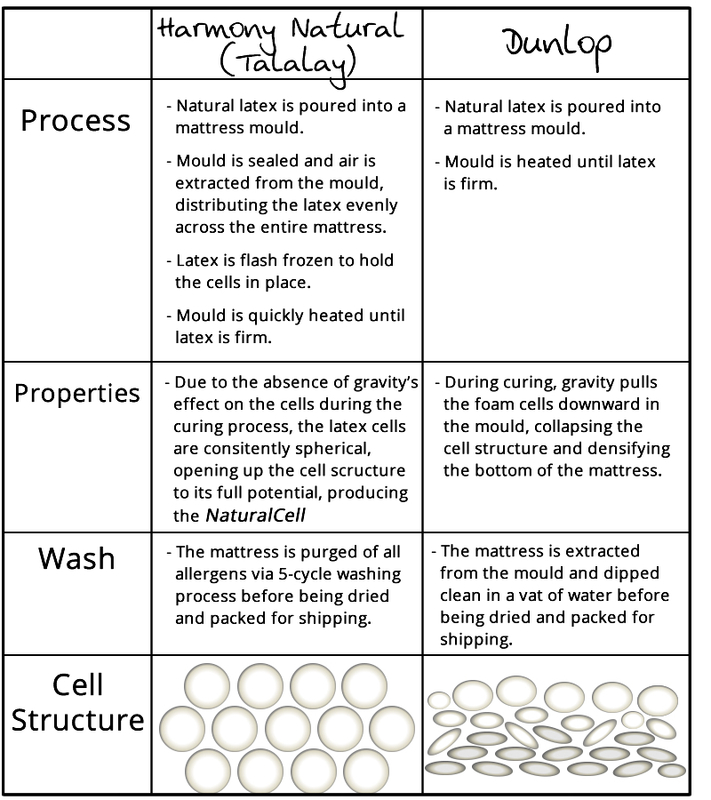 There are two different methods of making latex foam, regardless of the final product being natural or a synthetic blend: the Talalay process and the Dunlop process. Increased airflow and breathability – by allowing more air to pass through the open cell structure, you experiences better temperature regulation while you sleep. Consistent comfort throughout the mattress – a flattened cell shape can create inconsistent clumps of cells – which creates inconsistent support, firmness and pressure points – depending on how the cells fall into place. The NaturalCells are evenly dispersed throughout the mattress, eliminating these problems. Double the life of your mattress – The Talalay process also gives you the added benefit of doubling the life of your mattress by being able to flip it over. Both sides of your Harmony Mattress will offer the same comfort and support, due to the even distribution of our NaturalCells. A Dunlop made latex would be much firmer on the bottom due to the densification that occurs. One of the first steps in creating a latex foam mattress is gathering the ingredients and creating a liquid latex mixture that will be poured into a mattress mold. While the primary ingredient will almost always be liquid latex, many manufacturers will add in synthetic components or additives to their recipe (up to 60% of the mixture in many cases). These synthetic components make the product less expensive to manufacture. The final product is still made from natural latex, but it is not 100% natural through and through, and that makes a big difference. One of the challenges of producing any type of natural latex foam products is that they’re bulky and expensive to ship. In an effort to reduce these delivery costs, some manufacturers now compress their natural latex foam before shipping it to the store or customer. These reduced costs come at a price: foam performance and your comfort. Natural latex foam isn’t meant to remain compressed for extended periods of time as this damages the cell structure of the foam causing the product to lose its ability to bounce back.